In this firing I tried making cabochons with three layers of glass. This probably is a more normal method, capping with clear glass, so I expected this to work well and with few issues. As usual, I added a few other bits to see what happened. This probably going to be my approach always; adding extra bits to fill in space and for testing. Making good use of the space in a kiln is surely much more economical and a good practice to adopt, but thinking of what to include does take a bit of thought. This full fuse firing was all about testing a few ideas to make glass cabochons for jewellery. You will notice in the ‘Before’ photo that the items are placed on separate pieces of BullsEye Thinfire kiln shelf paper. For no specific reason other than to use up the paper offcuts. I have been finding some learning curves with my new hobby silversmithing. I started to make a silver ring with a bezel setting so I could include a glass cab. I made the ring that went fine and I made the bezel and that was fine too. Then I had to solder the bezel to the ring that is when it all went wrong. Well doubt set in didn’t it Ha Ha!! Good old doubt, I was soldering the ring to the bezel and I believed it had soldered but then the doubt set in and I had to keep heating the join and then it happened. 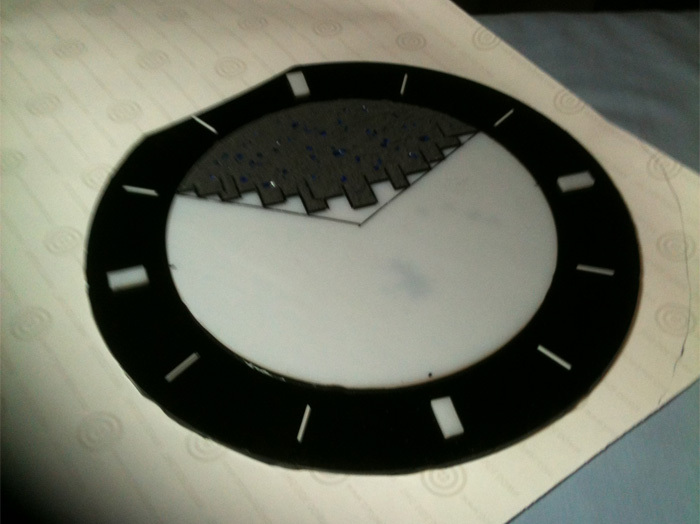 This was my first attempt at a fused glass clock face, but it was a bit of a disaster from the beginning. However, there are a few lessons to be learnt here. The concept was a black and white clock face with a city skyline in silhouette. The black and white I felt would give a nice clean and simple feel that could fit into any décor. This was a milestone – my very first glass fuse firing. What’s a glass puddle? Well, I didn’t have the faintest when I first heard the term. 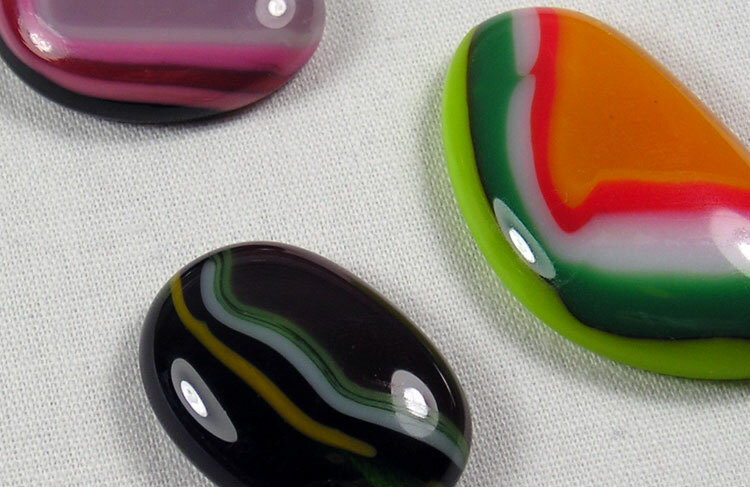 It is basically a technique for creating jewellery cabochons. The idea is to layer up a number of pieces of art glass in complimenting colours, then full fuse that together into a puddle. The glass completely fuses down and melts together into what is literally a puddle of glass. One day I noticed in the local newspaper that the Cobb & Co. Museum was running short courses and one of the courses was a silversmithing course. I have always wanted to do silver soldering. When I saw this ad I thought that this would be a great opportunity to learn how to solder. The funny thing is I wasn’t sure how I would be able to afford to pay the fee, but my husband noticed the ad as well and he said he wanted me to do it. So we looked at our finances and worked it out. This is the first post of what I expect to be many about the evolution of our studio. 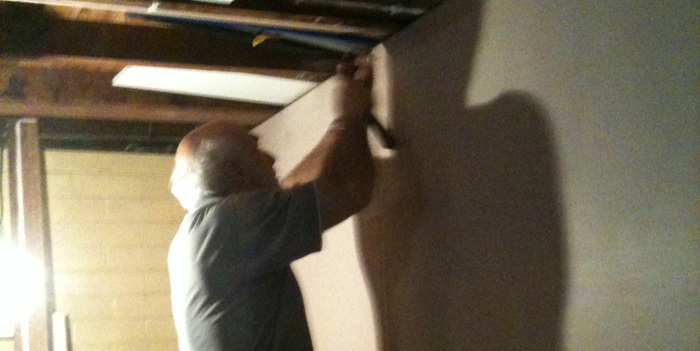 We are learning so we do expect to be making changes to the studio as we discover what does and does not work for us. Having said that, we love our studio. It is our new playground and where we spend quite a lot of time here. You can see we have a dedicated area for cutting and working with glass, another where Ann works with her creations and the kiln is in a separate area, well away from combustible items. This was actually a bigger problem than I expected. 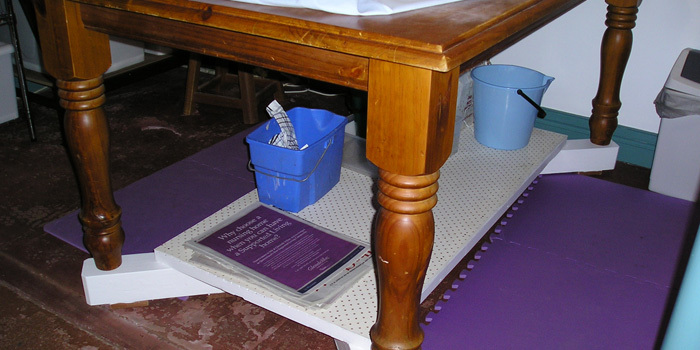 We needed a good sized workbench that was very solid and sturdy, and at the right height. The sizes was important because we needed enough room to have the cutting station but also area for project setup, kiln shelf preparation, general design work and what ever else came up. Room in the studio wasn’t a real big issue, but we had to consider future improvements and decided not take up too much space. Not sure if anybody is really interested, but thought I would post a little about building our studio. By the way, please excuse the photos. They were taken with an old iPhone. 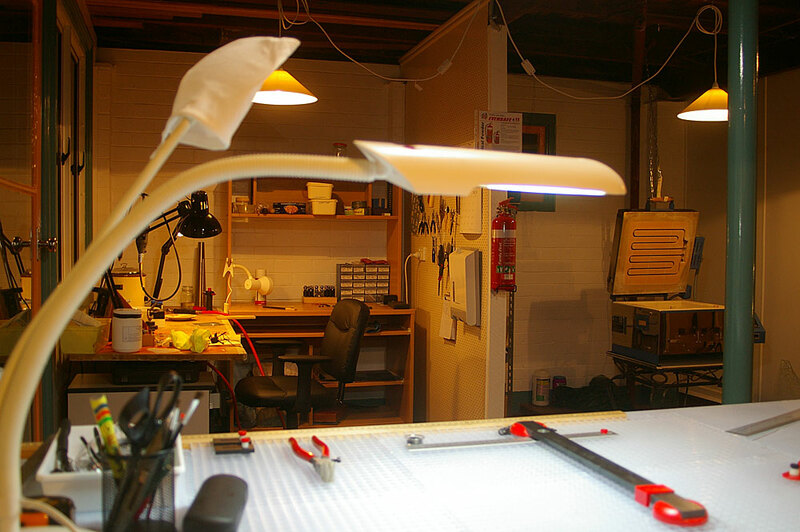 The studio is for working with glass, as in glass fusing, glass slumping and glass draping. It is also a work area for Ann working with silver, copper and other metals. She has another area in the house for more assembly work to do with jewellery and other crafts.